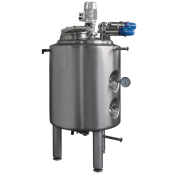 Used to produce fresh cheese, pressed or matured cheese and to stabilize the Ph of curd used to make string-type (“Pasta Filata”) cheese. 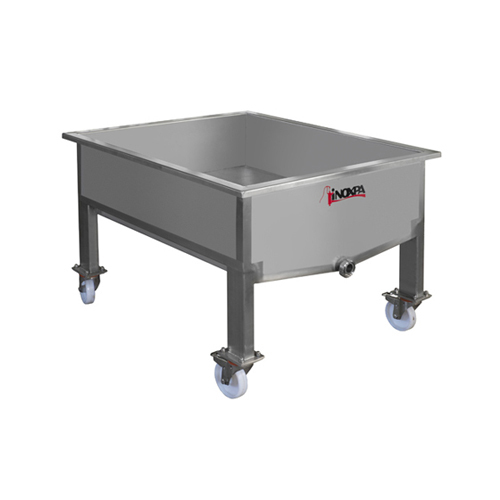 The Drainage Table is equipped with a perforated stainless steel AISI 304 sheet that allows easy drainage of whey. Once the process of curdling in the Vats has finished the resulting paste is discharged directly onto the Drainage Table to make semi hard- and hard-paste cheese or string-type cheese. For semi- and hard-paste cheese pressing is made using perforated sheets that are placed on top of the curd. Afterwards the curd is cut into blocks and placed into the forming moulds. 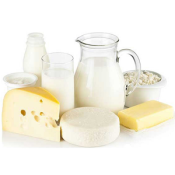 For soft-paste cheese the moulds are placed on top of the perforated sheet and with the use of a counter-mould, which acts like a funnel , allows the curd to be discharged directly from the Vats into the moulds. When we produce cheese for stretching (for example Mozzarella) the curd paste, after the stabilization of on the Table, is transferred directly to the Stretcher. 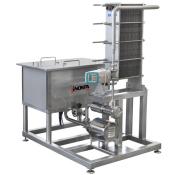 The left over whey can be discharged from the Table through a manual Butterfly Valve or with the help of an INOXPA sanitary centrifuge pump, which can be connected to the table as an option. 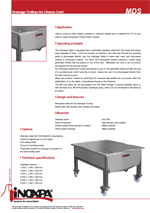 Moveable trolley for the drainage of whey. Mobile with high density nylon wheels and brake. Tôle de réglage de la hauteur de la pâte. des moules ou le caillage sur la même table.